The VCC is a safety product. Associed with its dedicated clamp lock detector, it is a locking and switch monitoring device. The VCC is used in pairs and assembled on the turnout first bearer. VCCs replace two slide chairs, thus forming an integral part with the switch rail and the stock rail. This special configuration provides the locking function, offers greater control of switch rail drive and permits mechanical tamping operations between bearers. 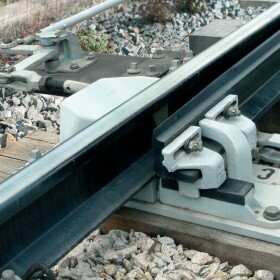 The position and locking of the switch rails are detected by clamp lock detectors, which provide electrical information on switch rail application opening and locking at the end of the movement.